The FunnelSeries displays a single series of data in progressively decreasing or increasing proportions, organized in segments, where each segment represents the value for the particular item from the series. The size of each segment is determined by the value of the corresponding series item. DataPoints: A property of type ElementCollection of FunnelDataPoints that gets the collection associated with the series. IsDynamicHeight: A boolean property that gets or sets if all segments in the series have the same height or the height of every segment is set according to its value. Default value is true. IsDynamicSlope: A boolean property that gets or sets a value indicating whether the form of each segment will be based on the ratio between the value from the current and the next segment. Default value is false. LabelFormat: A property of type string that gets or sets the string used to format the default label of the Segments which is the Label of the FunnelDataPoint. NeckRatio: A property of type float that gets or sets a value indicating the ratio between the top and the bottom bases of the whole funnel series. This property can take effect only if the Telerik.Windows.Controls.ChartView.FunnelSeries.IsDynamicSlope property is set to false. SegmentSpacing: A property of type int that gets or sets a value indicating the space between the funnel segments in pixels. SegmentStyles: A ObservableCollection of Styles that gets the styles applied to every segment in the series. You can use the ValueBinding property of the FunnelSeries to bind the DataPoint property to the property from your view models. FadeOpacity: A property of type double that gets or sets the opacity that is applied to the label connectors when the series is faded by the chart's hover interactivity. MinLengthThreshold: A property of type double that gets or sets the min length threshold. If a label connector is shorter than this threshold, the label connector is not drawn. Style: A Style property that gets or sets the connectors' style. The property accepts a Style targeting a Path element. 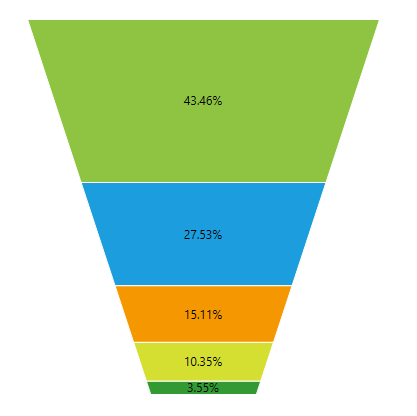 You can see how to style funnel series using different properties in the Customizing FunnelChart Series help article. 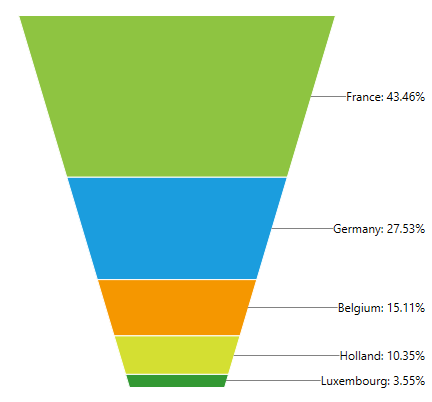 Additionally, you can use the Palette property of the chart to change the colors of the FunnelSeries on a global scale. You can find more information about this feature in the Palettes section in our help documentation.